The democratisation of 3D printing, through reduced costs and increased availability, has resulted in a new market emerging - that of the amateur printer. The growth of the World Wide Web has transformed the process of copying digital files from an onerous task requiring the swapping of data carriers (tape-to-tape copying anyone?) to one where digital files are only ever a few commands away or are delivered automatically without user interaction. While this has made life easier in many respects, disruption on this scale also presents challenges. The music industry, for example, has spent millions trying to solve the resulting unauthorised copying issues. The copying of any files will of course only be attractive if the copyist has the means needed to put the file to its intended use. For music and video files this is straightforward as even devices with moderate computing power have the required output interfaces. The main obstacle to copying physical objects is the absence of the means – both the tools and the skills required to use the tools – to create copies of the physical objects. However, 3D printing (otherwise known as additive manufacturing) means the problems faced by those whose products are data based, are now also being experienced by manufacturers of physical products. The democratisation of 3D printing, through reduced costs and increased availability, has resulted in a new market emerging - that of the amateur printer. Affordable 3D printing puts the tools for creating physical objects in the hands of a wide range of individuals and households. Even those without a 3D printer can ‘contract’ their printing job out to a large network of printer owners who are only too happy to press the print button for a relatively modest fee. And with much of the 3D printing process now automated, the level of skill required for creating tangible objects has reduced considerably. In order to support these amateur printers, websites have emerged dedicated to the distribution of digital design files for use in 3D printing. These files provide 3D print templates, making it increasingly easy for private individuals to download design files for products for home printing. Whilst amateur 3D printing is only on the cusp of becoming mainstream, this development has long been expected. One global freight and distribution company dedicated an annual conference over half a decade ago to the question of how the localisation of manufacture precipitated by 3D printing would affect its business. As with any new technology, 3D printing will require companies to adapt current business and legal strategies accordingly to meet the challenges of this brave new world. The traditional mechanism for protecting the copying of innovations is through intellectual property (IP) rights. This includes patents, design rights, copyright and trademarks. Elaborate methods do exist whereby IP rights can be used to remove products from the marketplace, or to prevent products from getting there in the first place. However, some of these methods, in particular detaining products when they cross country borders, don’t work when it’s only data crossing a border. In order to use IP rights to protect against loss of revenue and reputational damages, the distribution of files via the internet must be addressed. This does of course lead straight back to the attempts the music industry undertook to achieve exactly this. Businesses would do well to learn from this industry’s mistakes when attempting to combat unauthorised downloads using threats of court action for copyright infringement. Pursuing individuals can be costly and quickly becomes unwieldy. In addition, the large degree of negative publicity associated with pursuing private individuals for such acts is likely to discourage enforcement attempts. Finally, it should be noted that private individuals are often exempt from infringement of IP rights such as patents. It may not even be possible to pursue such individuals, even if you wanted to. The music and film industry eventually realised that the best way to combat unauthorised downloads was to pursue the websites that hosted the downloads, whilst also providing a viable option for consumers to purchase content legally online. Product designers and developers should therefore consider developing similar business models – based upon legal downloads of design files. As with the music industry, rather than fighting the technology, businesses should find ways to work with it, while still monetising innovation. Even those businesses that find a satisfactory model for monetising their intellectual creations may not be out of the woods. Low quality counterfeit goods can greatly undermine the hard earned credibility and image of a legitimate company in the public eye. Faulty and counterfeit goods also open the door to potential claims of liability and the erosion of consumer confidence. While counterfeiting has long been an issue for manufacturers and brand owners, the ability of 3D printed objects to circumnavigate borders and customs checks brings an extra dimension to this problem. So, what recourse might manufacturers have to stop websites which host and distribute unauthorised data downloads? Firstly, it is necessary to have a right that can be enforced against these parties. This is where IP protection is essential. IP rights holders should consider whether their current IP strategy provides protection against the unauthorised downloading of design files and printing of counterfeit products. For instance, patents that have been written to cover a physical product may not cover a design file for printing such a product. Equally, IP that protects a traditionally manufactured product may not cover one that is created via 3D printing. 3D printed products, for example, may not need certain components (such as screws) that would otherwise be essential on a traditionally manufactured product. Poorly drafted IP protection could therefore present an opportunity to competitors who seek to imitate rather than innovate. 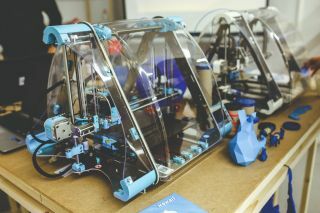 As a result, those involved in creating physical goods (even if the goods aren’t intended for 3D printing) will need to take account of 3D printing when looking to protect their ideas. Access to patent attorneys with a combination of detailed technical and legal knowledge is essential in this regard. Data security will also need to be considered. Manufacturers and product designers will need to ensure that their design files are securely protected from theft. Without these design files it is much more difficult for infringers to print knock-off products. Nevertheless, even if the original design files are never leaked, people may still be able to produce their own design files for printing counterfeit goods. These can be produced either through computer aided design (CAD) programs, or through the use of 3D scanners that can produce a 3D model of a product quickly and easily. Accordingly, IP protection will likely still be needed in order to prevent copying, even where design files are protected via strong data security. As with any emergent technology, 3D printing presents both opportunities and challenges. Solid IP strategy and protection will be key to those looking to maximise the opportunities, while minimising the risks as 3D printing becomes ever more ubiquitous.